Pink Tea Latte: Edible Obsession, Vancouver: Outpost Mini Donut Co. 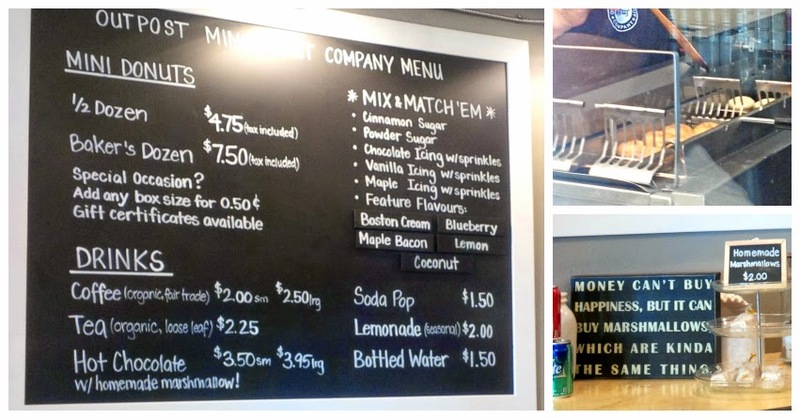 Edible Obsession, Vancouver: Outpost Mini Donut Co.
How can you not but love this amazing gourmet donut shop! Go Output Mini Donut Co.!! L- The cutest inside setup! Top R - Donuts being prepared! Bot R- Finished mini donuts! yes! MINI DONUTS! The Outpost Mini Donut Co. is in Steveston Village in Richmond BC. This place is no ordinary place, firstly this has to be the only store that specializes in donuts and not be at a carnival or amusement park. Secondly, these are GOURMET mini donuts! Not just cinnamon sugar, but there is boston cream, and lemon curd. I got half a dozen = 2 Boston Creams, 2 Lemon Curds, 1 Cinnamon Sugar and 1 Coconut! The custard for the Boston Cream mini donut was AMAZING. It was the perfect consistency and texture with the perfect amount of sweetness. Glazed over with chocolate.. YUM. And my favourite of course is the Lemon = dollop of tart and sweet lemon curd with more drizzling of lemon icing! Top R - Mini Donuts being freshly cooked!!!!! 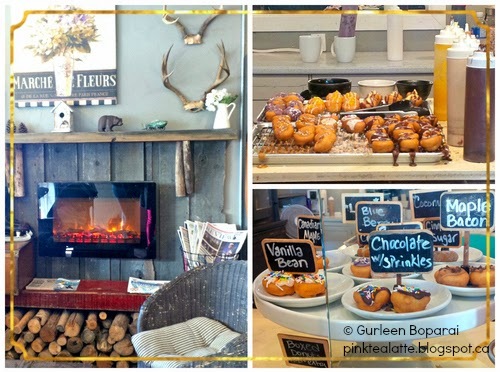 The donuts are made fresh daily and the ingredients are locally sourced! In addition to the classic flavours, they have featured seasonal flavours! Generally anything that is not too overpoweringly sweet is right up my alley. So my favourites are the lemon, Boston cream, peanut butter and jelly and the best of them is cinnamon sugar! Trust me, these cinnamon sugar mini donuts are a million times more scrumptious then the ones you get at the fair. Also they are far better balanced with sweetness and nutty cinnamon! and remember "sharing is caring!" Desk Goodies: Ten Chic Items for your Desk! Latte Moment: April 24 Free Starbucks Day? Chic Life: LUSH Fresh Face Masks Review! Desk Goodies: Too Kewt PUG card! SMART SNACKING: Naturebox April 2015!